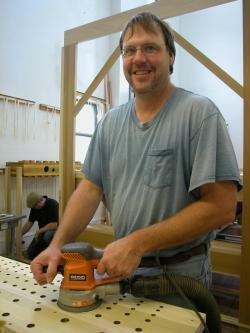 Mike Meyer came to Buzard in April of 2012 and is now shop foreman. He is responsible for oversight of the production staff, quality control and shop safety and maintenance. He did siding and roofing and also worked with the Champaign Park District. Mike has a BS in Recreational Management from the University of South Dakota where he also had a minor in fine arts, specifically sculpture.